Heat Oil in the pan and add the mustard seeds and fenugeek seeds. When the splutter, add the green chillies and curry leaves and fry for about a minute. Add the sliced onions and garlic and fry for 2 mins till the onions become soft. Now add the chopped tomatoes, chilli powder, cumin powder, turmeric, soya sauce and cook for couple of mins till the tomatoes become tender and the oil separates from the gravy. Sprinkle a bit of water while cooking so that the masalas do not stick to the pan. Add the chopped scallions, mix with the cooked tomatoes and then add the sardines along with the tomato sauce. Mix well and cook for 1-2 mins ( You don’t have to cook for long as the sardines are already ready to eat !). Adjust salt to taste. 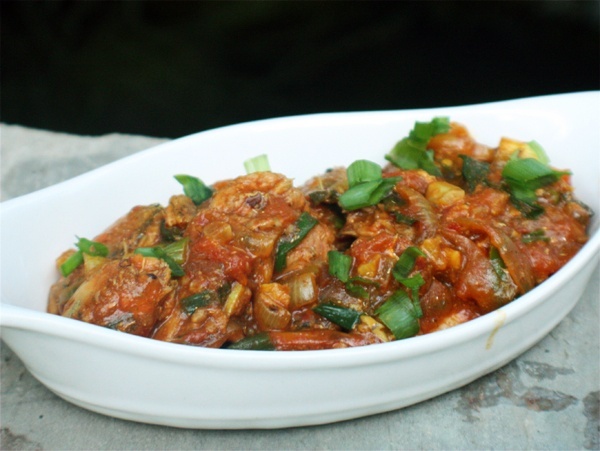 This entry was posted in All Recipes, Fish, Sea Food and tagged Easy Sardine Curry by Kamakshi. Bookmark the permalink. Just my style… quick and easy!! Thanks! !